As ai r conditioning specialists, we are equiped to provide our customers with all aspects of air conditioning installations, service and repairs throughout Bridgend, Cardiff, Swansea, Newport and South Wales. We install, service and repair all types of air conditioning systems and our competitive prices, coupled with our clean and efficient service, has earned the company an enviable reputation which is growing from strength to strength. Due to their large areas of glass, conservatories can quickly become unbearably hot in the summer months and can be too uncomfortable to sit in for any longer than a few minutes. They can also become uncomfortably cold during the winter months which renders them unusable for a considerable part of the year. We can supply and install a reverse cycle heat pump which can solve this issue for you by providing the ideal temperature all year round. ‘Cooling’ for the summer months and very affordable ‘Heating’ during the winter months. This makes it possible to fully utilise your conservatory all year round. Our systems have a typical coefficient of performance of around 4:1 or even 5:1 meaning that, for every 1.0kW of electrical power consumed, they emit or remove 4 to 5 kW of heat, depending on whether you want to heat or cool the room. This method of heating and cooling your conservatory is far more efficient that conventional methods such as gas or electric. Heating or cooling is provided within a matter of minutes, which means that there is very little delay between switching the system on and enjoying the comfort it provides. The perfect working environment is essential for all businesses and office air conditioning can help to create a climate for success. 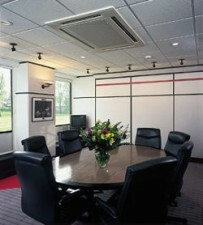 Air conditioning is an ideal way of controlling the air quality inside any building, large or small. Not only does it cool in the summer months but air conditioning can also heat, replacing traditional heating systems. More and more people today are experiencing the benefits of comfortable working, living and leisure environments made possible with air conditioning. Offices today are packed full of computers, printers, photocopiers and other electrical equipment, all of which generate a great deal of heat. Combined with increased insulation standards and air tightness of modern offices, you have a huge cooling challenge on your hands. Effective climate control is therefore crucial in order to maintain a comfortable environment in which to work. It is also scientifically proven that accidents tend to occur more frequently during extreme temperatures – the optimum temperature appears to be about 20°C. Mental performance and work rhythm drop off sharply when it is too hot. Obviously, the provision of a constant environment is subject to many influences. For a building to operate comfortably and efficiently, due attention must be paid to its services. Our team of engineers provide a comprehensive installation, maintenance and repair service throughout South Wales and England which can help you achieve a comfortable working environment. Red Dragon Air Conditioning Ltd provides high quality service and repair to its customers at very competitive prices. Our thorough approach to providing a high standard of service has gained praise form all of our customers who continue to use our services year after year. The environment in which the air conditioning or refrigeration systems is required to operate will ultimately dictate the frequency at which servicing intervals should take place. If the system requires servicing more than once each year, we will provide a discounted rate for any additional servicing requirements.